1 of 6 Melt butter in saucepan. Add onion and garlic; cook until softened, 5 minutes. Add mustard, paprika, cumin and cayenne; cook 1 minute. Add ketchup, sugar, vinegar and water; simmer, covered, 30 minutes. Uncover; simmer 30 minutes. Add salt and pepper. 2 of 6 Heat oven to 350 degrees F.
3 of 6 Heat oil in large ovenproof Dutch oven; add pork; brown, 10 minutes. 4 of 6 Bake, uncovered, in 350 degree F oven 30 minutes. 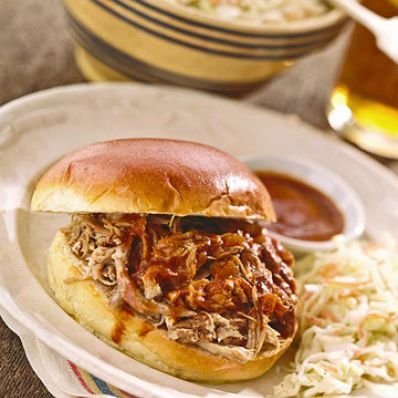 Pour 1 cup of barbecue sauce over pork. Cover pot. Lower to 250 degrees F. Bake 3 to 3-1/2 hours, basting meat occasionally, until instant-read thermometer inserted in middle of roast registers 170 degrees F to 180 degrees F.
5 of 6 Let cool slightly. Trim off excess fat. Pull meat apart using two forks. 6 of 6 Mix pulled meat with rest of barbecue sauce in a large bowl. Serve on buns with Hearty Coleslaw on the side. Per Serving: 1040 mg sodium, 2 g fiber, 8 g sat. fat, 149 mg chol., 23 g Fat, total, 40 g carb., 44 g pro., 543 kcal cal.